AR-15 rifles are lighter and have a higher rate of accuracy than the AK-47, but the AK-47 is considerably cheaper and more dependable in comparison. 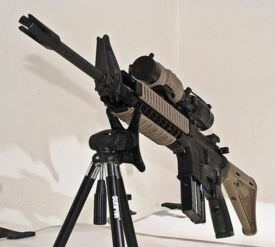 Both are extensively used by the military and police, as well as for general purpose hunting rifles and self-defense. The AK-47 is an assault rifle designed by Mikhail Kalashnikov in the Soviet Union in the 1940s, while the AR-15 is an assault rifle designed by Eugene Stoner in the U.S. in the 1950s. Adjustable iron sights, 100–800 metre adjustments, 378 mm (14.9 in) sight radius Adjustable front and rear iron sights. AK-47 1948–51, AK-47 1952, AKS-47, RPK, AKM (most ubiquitous variant), AKMS .223 Remington/5.56x45mm, .45 ACP, 5.7x28mm, 6.5 mm Grendel, .338 Lapua, 6.8 mm Remington SPC, .50 Beowulf and .50 BMG. 20 or 30-round detachable box magazine, also compatible with 40-round box or 75-round drum magazines from the RPK Various, including 20 or 30 round staggered-column magazine and drum magazines with 90 and 100 rounds. AK-47 stands for Kalashnikov automatic rifle model of 1947. It is a selective fire, gas operated 7.62x39mm assault rifle. Most 47's are actually the 1959 AKM. AR-15 is a lightweight semi-automatic rifle built with aluminum alloys and synthetic materials.It is air-cooled, gas-operated, magazine-fed and has a rotating-lock bolt. No federal restrictions on semi-auto variant ownership in the US. Full-auto restricted in the US. No federal restrictions on semi-auto variant ownership in the US. Full-auto restricted in the US. Developed in the USSR by Mikhail Kalashnikov in the late 1940s. Based on the 7.62 mm AR-10, designed by Eugene Stoner, Robert Fremont, and L. James Sullivan of the Fairchild ArmaLite corporation in 1958. Iraqi airmen fire AK-47s during a firing drill. The AK-47 is not as accurate as the AR-15. The accuracy of an AK-47 (16" barrel) is 2-5 MOA, while the AR-15 (16" barrel) is around 1-3 MOA, depending on the barrel installed and fore end provisions for barrel float that eliminate deflections caused by the operator's support and/or sling tension. According to the World Bank, there are 500 million firearms in circulation around the world; 100 million are in the Kalashnikov family, and 75 million of those are AK-47s. 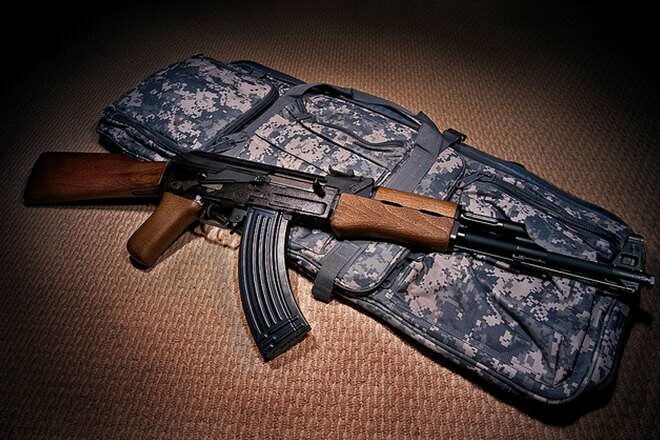 The popularity of Kalashnikov rifles is at least partly connected to the lack of regulation on their already affordable production. The Soviet Union did not control the manufacture of AK-47s through copyright law or patents, meaning production of the assault rifle spread quickly. Both the AK-47 and the AR-15 are available in the United States. However, some states have restricted their sale and use. 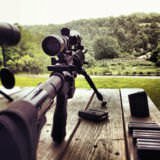 New York, California, Maryland, and Connecticut regulate possession of AR-15 rifles either through restriction of certain features or outright bans of certain manufacturers' models. For example, the A3 tactical carbine is legal for sale and possession in the United States generally, but is illegal for sale in California. 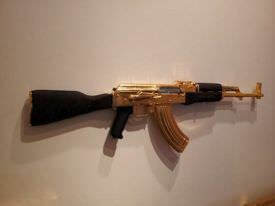 A golden AK47 seen at Parlor Gallery in Asbury Park. The AK-47 uses 7.62x39mm M45 cartridges, while the AR-15 uses .233 Remington or 5.56 NATO cartridges. The AK-47 has a barrel length of 415 mm, while the AR-15 has a standard barrel length of 508 mm. The AK-47 is a gas-operated, rotating bolt (Long Stroke Gas Piston) rifle. The AR-15 is a direct impingement or a rotating bolt rifle. The AR-15 is a semi-automatic weapon. Gun-control advocates consider the AR-15 an "assault weapon" even though it fires about 45 to 60 rounds per minute, which is significantly lower than fully automatic weapons like the M16, which can fire up to 900 rounds per minute. The AK-47’s magazine features a pronounced curve that allows it to smoothly feed ammunition into the chamber. It has a heavy steel construction with “feed lips” to make it resistant to damage. As the AR-15 was designed to be more lightweight and less durable, its magazine is made of pressed/stamped aluminum, and its feed lips are weaker than the AK-47’s as a result. Ranging between 2.27 and 3.9kg, the AR-15 is lighter than the 4.3kg AK-47. The safety (selector) of an AK-47 is designed to be easily hit with the index finger while the middle finger remains on the trigger. Magazines are inserted and removed by a simple rocking motion. The AK-47 is extremely friendly to left handed users in terms of controls and ejection. AR-15's safety (selector) switch is easily manipulated without losing sight picture. It's smaller size makes it more difficult to use under stress. The AR-15 is unfriendly to left handed users both in terms of controls and in terms of shell ejection. A fully automatic AK-47 has an effective range of	300 meters (330 yd) whereas for a semi-automatic it is 400 metres (440 yd) semi-automatic. 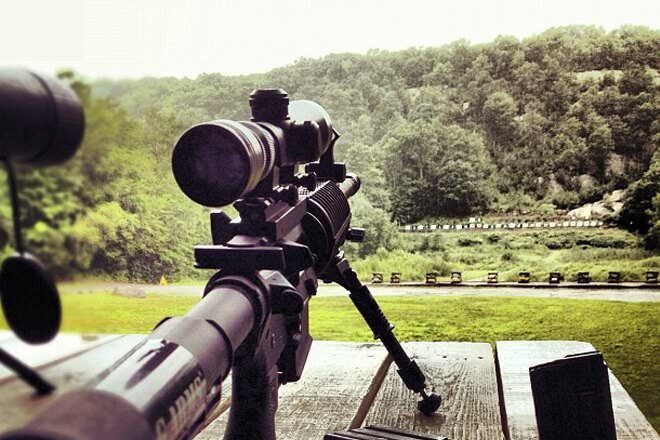 The semi-automatic AR-15 has an effective range of 400-600 meters. 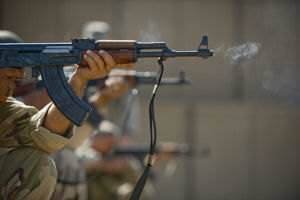 In the AK-47 fully automatic, the recoil is mild and predictable. In the AR-15, the recoil is easily controllable, but difficult to predict. The AK-47, which was specifically designed to function in extreme environmental conditions, is considered more dependable than the AR-15, which is sometimes prone to failure when exposed to dirt, dust, and mud. To maintain reliability, the AR-15 needs to be cleaned following each use. Although many variants are available for both the rifles, when comparing the base models, the AK-47 is cheaper as compared to AR-15. Price of the AK-47 can range from $350-$600. Price of the AR-15 can range from $750-$1,500. The AR-15 is sometimes called "America's Rifle" because it is the most popular long gun in the country. There are around 10 million AR-15 units currently in the United States. In fact, the AR-15 has also been popular with perpetrators of mass shootings — the gun was used in the San Bernardino, Aurora and Sandy Hook shootings. Will either guns stop or kill a bear?